Learn how to differentiate the Literacy Block for your diverse range of students in all areas of literacy instruction – speaking, reading, comprehending, writing, spelling and creating. Using strategies supported by embedding technology within your instructional approach and making the best of the technologies available to you. Whether those technologies be a fully WiFi-enabled one-to-one iPad classroom projecting up onto LCD touchscreens, or whether you are working in a "technology deprived classroom" with just one ageing interactive whiteboard and a lone iPad to be shared amongst all of your students! Join us to learn how to make the most of what you have on hand. And to see what is possible should you add extra technologies to your classroom literacy kit. This workshop will give you ideas for application in ALL primary school classrooms, for ALL students in the room! for more exciting workshop info. 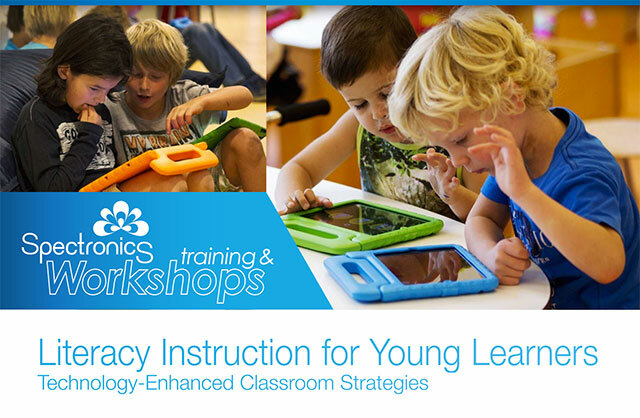 Workshops Sydney, Melbourne, Brisbane and Perth | November 2014 | One week only! The other unique learning opportunity offered by this workshop is that it is jointly presented by an early childhood educator and a speech pathologist. As an experienced early childhood classroom teacher, Jenni McDonald, knows what it’s like in the real world of education. Like you, she has simultaneously tried to juggle the needs of many students while striving to accommodate their individual learning needs. She has also advised other teachers as an Early Childhood Literacy Consultant, so she appreciates how you feel when you have "experts" come in trying to tell you what to do in your busy classroom! Jenni’s contribution will be balanced wonderfully by input from speech pathologist, Amanda Hartmann. As a result of her 17 years of experience in her private speech pathology clinic, working in schools across Australia and SE Asia, and in her role as a member of the Spectronics Consultancy Team, Amanda has developed a keen eye for identifying the pre-requisite skills for reading and writing that may need extra attention in individual students. She is also tuned into the need for her recommendations for intervention strategies to work within a classroom environment. Hold onto your hats, and your iPads! This is going to be a fast-paced information-packed day delivered by presenters who passionately live and breathe effective literacy instruction practice. They love it! How to register to lock in your place now! Ready to Register NOW? Click here to register online! Added bonus. If you want to take the workshop home with you to watch over and over and to share with your colleagues, they are even offering you the option to purchase the full day of video, synched with the slides for easy navigation. Along with the option to download the audio for inspirational listening on the go on your mobile devices. if you would prefer to fill in your registration form and fax or email it through to us. Any more questions? Sing out to me on phone (07) 3808 6833 or via email on events@spectronicsinoz.com. I look forward to hearing from you if you need my help with anything at all. PS Following are just some of MANY positive comments following recent Spectronics’ workshops, events and conferences. Ask us for more. We got a pile of them to share if you need them! 2 Responses to Take your literacy instruction to new levels for YOUR students. All of them. This looks like a fantastic workshop. Unfortunately I will not be able to attend, I will be on the look out for other workshops though! Thanks for your positive feedback Box Hill Speech Therapy team. We might have to see if we can run a follow up workshop around this content next year as it has been popular. We will be having the full day of workshop presentations professionally recorded, so if you’d like to be there, without actually being there, that is an option too.